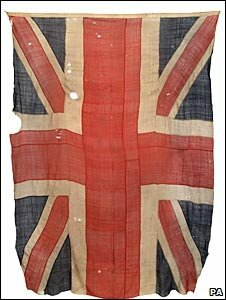 The union jack will go under the hammer later this month after being put up for sale by one of Clephan's descendants. It was treasured by his family, who kept it in a drawer to preserve it. Auctioneers expect the flag to fetch £10,000 to £15,000. Charles Miller, through his own auction house, is selling the piece in London on 21 October, Trafalgar Day. He said the flag was the only known surviving union jack from the battle. "I think it's hard to overstate the historical importance of this flag," he said. "This was the greatest naval action ever fought. "The great thing about the flag is it's one of the most emblematic items you can get from Trafalgar. "This is a bit of naval hardware that has actually served in the action." Clephan, from Scoonie in Fife, spent his early years as an apprentice weaver and went on to join the Merchant Navy. He retired in 1840 with the rank of captain and lived in Edinburgh for 11 years until his death at the age of 83.